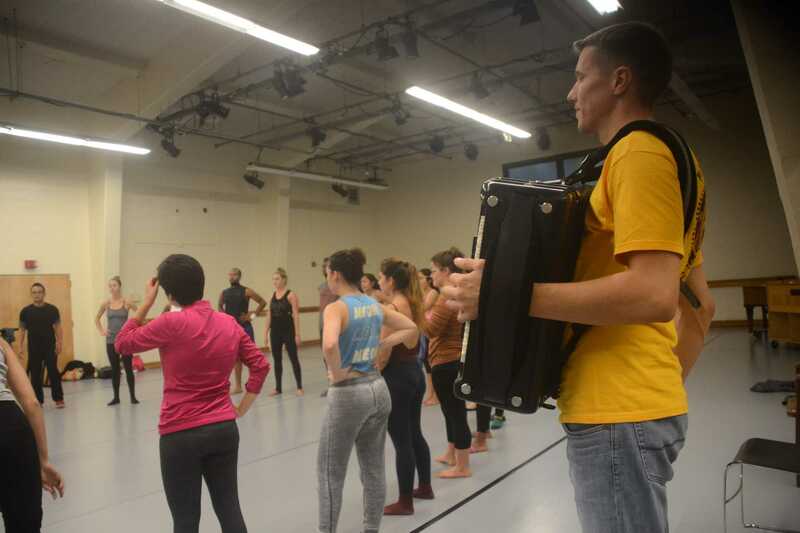 Arsenije Peric, the music director for Talija, provides musical accompaniment with his accordion during a special guest lesson in the Gymnasium dance studio on Thursday Oct. 9, 2014. Peter Snarr / Xpress. Dance students could lose one of two rehearsal spaces next semester to make room for a new museum in the Fine Arts Building, in an effort to consolidate the College of Liberal and Creative Arts. The change comes as University officials attempt to unify the LCA into central locations, Interim Dean Daniel Bernardi said in an email. As of now, the college is spread over six different buildings on campus including the Science and HSS buildings, which house political science, history and other departments. Spaces and classrooms are being moved to accommodate the inclusion of departments not located in Burk Hall, Humanities, Fine Arts and the Creative Arts buildings, including the dance studio in the Fine Arts building, according to Bernardi. As of now, dance students have two available rehearsal spaces, one in the Gymnasium and the other in the Fine Arts Building. The studio in the gym is bigger, but the second studio has lockers and dressing rooms nearby. “It’s central to our department,” said Felicia Stiles, a dance major. If the studio is removed, dance students said they will have to rehearse once a week for extended hours, which will strain their bodies and put them at greater risk of injury. In addition, curriculum may be cut with only one space available for class time due to scheduling issues, according to dance major Sarah Wells. “(With the studio removed) it will be very difficult for the program to maintain its integrity,” said Wendy Diamond, a dance instructor and lecturer. With a department composed of two tenure-track professors and 70 majors, the college cannot justify the amount of space used by such a small department, according to Bernardi. Dance students, however, insist they use up every aspect of the studio. The dance studio currently resides above the Coppola Theater where music rehearsals have disrupted classes in the theater below. Putting a museum above the theater could take away issues of sound bleeding into lectures. A replacement space has not been found for Spring 2015, which Bernardi said has been a challenge. Students in the dance department said they don’t see the worth in paying full tuition for an insufficient program, even if it’s temporary. “I’m not about to pay full tuition when I only get half of the curriculum,” said dance major Angelica Trinidad. Dance students plan on protesting the changes by gathering signatures and sending petitions to the College of Liberal and Creative Arts offices this week. “We’re not going to go down without a fight,” said McKines. No professional dance organization teaches classes once-a-week in four-hour blocks….Dean Bernardi has not given a reason why the Dance program can’t continue to use FA203 until a suitable replacement has been found and prepared. Here it is folks…if u really want to see a sorry site–just take a gander at the journo pedagogues and they’re allegience to “big tech”–wheres our money going folks? Just ask the “big cheese” or the resident pants-hater or the ol’ soft poo. If u care about tumblar more than our hard (l)earned greenbacks–theirs the door.